The new buildings will have a shared, cubic look. Green areas and trees will help to soften the overall impression. Architectural work is carried out by Hallen & Nordby A/S. The buildings connected to the new premises at the Dokhavn will be equipped with workshops, stores and logistics facilities – unifying ESVAGT in a single location with a single architectural style. Solar panels will contribute to their green profile. 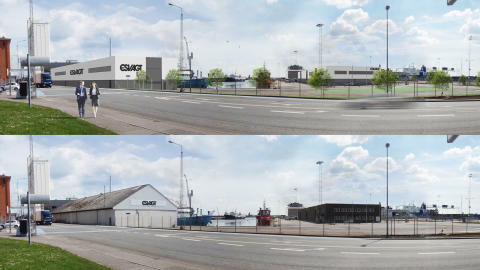 By building the new premises at Dokvej 4 in Esbjerg, ESVAGT has made a striking statement on the harbour area. The building has just been awarded a prize by the City Foundation at the County of Esbjerg, Esbjerg Kommunes Byfond, (see the article in this edition of the ESVAGT News) – and it is great that the city of Esbjerg likes the style because more of the same is on its way. ESVAGT has purchased IAT’s base and warehouse on Nordre Dokkaj and Vestre Dokkaj, which are right next to the new premises. Work to bring all 4,000 square metres of shipping company under the same architectural roof is well underway. ”We will have the facilities that we need and gain an architectural unity with our office buildings. The premises will be in the same style as the office buildings, with a black base and white façade. We will also add a handsome green touch to the entire area to bring colour and nature into the overall impression of our headquarters. It will look good,” he says. “There are several obvious advantages in concentrating all the shipping company’s skill sets under one roof. 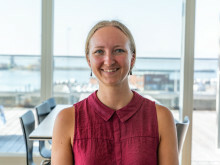 Idea sharing and sparring are made easier – and are likely to be more frequent thanks to the proximity and sense of fellowship between sea, workshop and office in everyday working life,” says Kristian Ole Jakobsen. Bringing all activities to one address also means a significant upgrade in terms of space, which will give us room to expand in the way we expect to in the next few years. There will be 2,200 square metres of warehouse and workshop compared to the 800 square metres they used to have – and the location also means first claim at the quayside at the inner section of Vestre Dokkaj, where ESVAGT will moor its crew change vessels. ”We will be able to offer better facilities to our seamen on land and it will be easier to achieve the close dialogue with them that we work hard for. Our crew change vessels can almost moor directly up to the office buildings and that is bound to create a closer bond between those based at sea and those in the land based organisation,” says Kristian Ole Jakobsen. ESVAGT’s location at the harbour means that consideration must be taken to others who need to be at the quayside. For example, the harbour crane route passes right across our area, which means that our green elements in the form of trees will have to take account for that. ”Placement of the trees will, however, have to take the crane route into consideration. Another example is the warehouse buildings where we will be installing a sluice function. The first ten metres from the quayside belong to the harbour and there may well be occasions when this area is used for something else. So the entrance to the sluice will be placed on the side of the building that faces the road,” says Mikkel Bjerrum. The new facilities are expected to be ready in May 2015. The building on Nordre Dokkaj will be fitted out with a workshop and administration offices (for the workshop). The watermist system, which ESVAGT uses for fire-fighting on vessels, will be installed in the area for protection and demonstration purposes. The engine workshop will be constantly (slightly) over pressure to prevent dirt and dust being sucked into vital parts. Work involving sanding, welding, gluing and painting will be isolated so that they will only affect the areas where the work is carried out. An engine room with test tank will be installed for testing engines. The logistics, servicing and warehouse building will serve as base for seamen. There will be lounge areas, rest areas, briefing and de-briefing rooms, crew rooms with welfare facilities, and so on. The building will also consist of three independent warehouses that will be fitted out as goods receipt facilities and stock room – including space for essential spare parts under their own roof.